GALION — The city has opened the Taylor Road composting facility open for residents to drop off limbs gathered after Sunday night’s storm. The facility will be open today until 2:30 p.m., and will reopen Tuesday from 7:30 a.m. to 2:30 p.m. The facility is at 545 Taylor Road. It also will be open on its regularly scheduled weekend, Nov. 17-18. The city’ service department will do limited curbside pickup as manpower allows. Workers will only be picking up limbs and yard waste, which should be piled near the curb. The city has Electricity has been restored to most in Galion affected by Sunday night’s storm. Employees of the city’s line department and service department are continuing to clean up storm damage. City officials are asking that if residents see a power line knocked down,to please stay away from it. Call the city at 419-468-1857 to report damage or possible live wires. You may also call this number if you are currently without power. No serious injuries directly related to the storm were reported. Domino’s Pizza, which is located just a couple of blocks from storm-damaged homes and railways, will be giving away slices of pizza today to those affected by Sunday’s violent weather. The giveaway is from noon to 1:30 p.m., and again from 6 to 7:30 p.m.
“I am the franchisee of the local Domino’s,” said Anthony Satterwhite in a post on social media. “While I left apparently before the storm hit, my team has informed me of the damage in town. “We will give away pizza slices to those impacted by the storm until we are out of product. We will then do the same thing for supper time between 6 and 7:30 p.m,” Satterwhite said. Domino’s Pizza is at 144 S. Liberty St., Galion, across from the police and fire station. All streets have been reopen, but some sporadic street closures are possible as the clean-up effort continues. The American Red Cross is assisting residents in the worst hit areas. At least homes sustained significant damage. Please call the agency at 419-989-7035 if need temporary shelter is needed or have other urgent needs must be met. Officials from the Crawford County Emergency Management Agency and National Weather Service are assessing the storm damage this morning. They will determine whether or not there was a tornado last evening. Courtesy photo Power has been restored to most residents affected by Sunday’s storm. It is expected that all residents will be hooked up by the end of the day. Clean-up efforts are ongoing throughout the city and could result in temporary road closures and debris is removed. 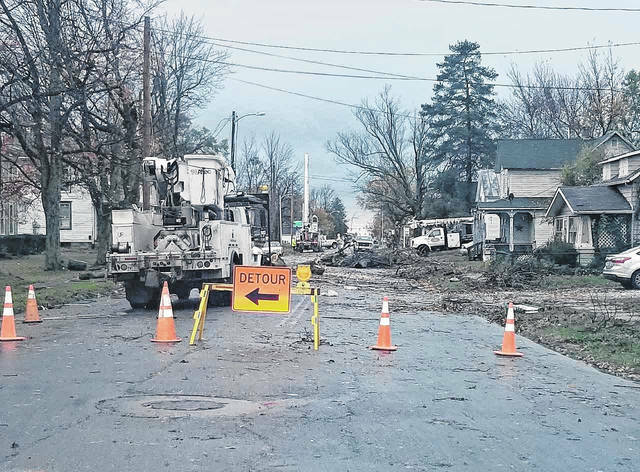 https://www.galioninquirer.com/wp-content/uploads/sites/38/2017/11/web1_road-closed-1.jpgCourtesy photo Power has been restored to most residents affected by Sunday’s storm. It is expected that all residents will be hooked up by the end of the day. Clean-up efforts are ongoing throughout the city and could result in temporary road closures and debris is removed.